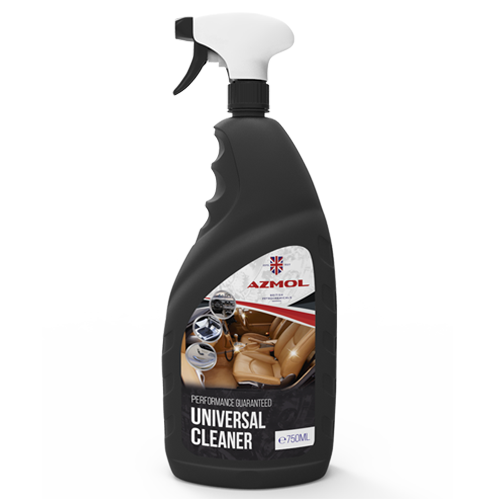 Universal cleaner for passenger compartment AZMOL Universal CLEANER. Universal agent 3 in 1 for quick cleaning of passenger compartment. Cleans textiles, vinyl, plastic and glass in a quick and effective way. Alcohol-free and streak-free. Restores the original appearance and color. Application: clean the surface from dust. Apply the agent with a sprayer onto contaminated area at a distance of 15-20 cm from the surface. Wipe with clean dry cloth in 10-15 seconds. Treated water, non-ionic surfactant < 5 %, potassium hydroxide, complexing agent, sodium hydroxide, flavoring agent, preservation agent, coloring agent.